And who wouldn't love sugary tea, especially in this lovely setting that you have created. Beautiful, magical, charming! This is really lovely - such a sweet scene. I absolutely love the little girl's oversized hat. Beautiful colours, beautiful characters. Oh how wonderfdul! I absolutely love all of thegreat details, and the characters are a great group. I LOVE, LOVE, LOVE the Ogre and little girl illustrations !!! they are soooo sweet together !! So sweet and beautiful !!! It is beautiful. The little dog is so cute. I love how the Autumn leaves frame the scene. What a great tea party! Lovely characters and atmosphere... I really admire how well you are carrying the characters through the the IF themes. What a treat this is to get to see a story build a week at at time. Wonderful characters and I love that big wonderful nose on the ogre fellow. Excellent! Oh Kathy...this is so wonderful! I love the colors, the texture, the mood and the composition...what's not to love! Another amazing one! This is so sweet! I really like your 'gentle' ogre. Love the way you've handled the foliage too. Lovely! What a wonderful little story you've got growing here! Kathy your work is masterful!!! Kathy, Kathy, Kathy, you have just stolen my heart with yet another one of your fantastic illustration. No, really. I LOVE Alice in Wonderland!!! It's my all time favorite stories. I collect the every book I can get my hands on. I love to see how people will illustrate the story. Your illustration has this kind of feel to it. 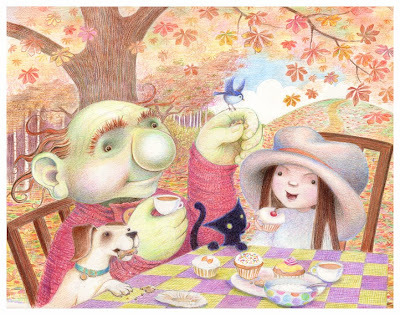 I love the friendly Ogre invited for tea the little girl with cupcake in hand and the animals are done so loving. I can truly tell that you enjoy each moment with pencil in hand. It's brilliant just like you. Thanks so much for stopping by. I really appreciate it. Lovely image and lovely soft colors! 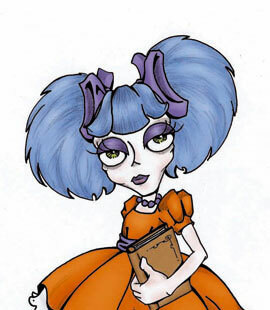 Another wonderful illo Kathy. Excellent as always!!! I love this trio Kathy!! This is beautiful! wow, fantastic!! your coloured pencils technique is amazing..! I didn't know that Ogres liked tea. Another great piece your tecnique is wonderful !!! OH!!! Kathy, I'm in love.....the ogre is absolutely adorable. Lovely family as always! Love the autume scene! This is absolutely adorable! I love your autumn colours, the atmosphere, the characters, that little blue bird... Beautiful! Wow! They are really having a great time here. Beautiful autumn splashs, sentimental friendship gathering spot at this gorgeous garden setting. I also love the small little bird here. Look like she has created a conversation....for the friends here. love all your works and this Illo is excellent. Lovely, especially the delicate fall leaves, & I'm intrigued by the story you are developing. Fab work as usual. I love the autumn leaves (my fave time of year). So much detail. Are these illusts part of a book? your work is brilliant… i am noticing a theme lately… and special reason for the ogre in the last three? Great little series you have going here. love all the details! Potential story? I LOVE this! Look at those beautiful fall leaves and the little patch of blue sky for the little birdie. And the delicious cupcakes and polka dot creamer and that HAT! I love everything in this picture. I do hope you're creating a picture book from these. i want to honk his big ol nose :) this is truly magical!!! Ok, when is the book coming out? Love these characters! I don't think I've ever seen a more lovable, benign ogre. Love him to bits! very beautiful color and details, and you should know that how I admired about your persistence. You are great. beautiful details Kathy!...um...can I adopt the kitty? I really love your work! *_* Great! I hope to see your "strings" illo soon.. Your style is amazing ! Beautiful ! Oooooh, me gustaría estar alii sentada con ellos. Preciosa ilustracion.